Look at him. He’s one of cinema’s most beautiful faces. Forget Garbo – did she ever battle hurricanes, leap from speeding trains or play billiards with a hand grenade? As a baby, Joseph Francis Keaton was hurled – very literally – into his parents’ violent slapstick vaudeville show. Never smiling, ‘Buster’ just took it on the chin. The world has always been a chaotic, dangerous place. He’d just make sure it was a hilarious one, too. Make no mistake: Keaton isn’t just a comedian, he’s a true master of the medium. His Civil War action classic The General glues together laughs, adventure, romance and suspense with genius detail. What still smack you in the face, though, are the stunts. More rubber than flesh, Keaton makes Tony Jaa look geriatric, never more so than in the disaster-comedy of Steamboat Bill Jr, boasting the most elaborate and dangerous set-pieces in cinema history. Sherlock Jr, meanwhile, still looks like a modern marvel: a movie about movie magic in which Keaton plays a projectionist who dreams he’s wandering into his own film. The Buster Keaton Chronicles ‘ fabulous six-disc compendium gives us all three – and 25 more movies from the comedian’s ’20s purple-patch. We’re talking a string of back-to-back masterpieces… The Three Ages is Keaton’s action-packed mick-take of DW Griffith’s Intolerance; Our Hospitality sees him whisking comedy, love, satire and a gobsmacking waterfall sequence into his first full-length classic; tour de force The Navigator strands him on an ocean liner – then chucks desert-island cannibals into mix; romper Seven Chances gives him 24 hours to bag a bride; Battling Butler buffets him around the boxing ring; while College sees him hit the sports field to woo a co-ed. That’s nine masterpieces in six years. Chaplin managed just two in that time. In fact, the only baffling omission in this otherwise definitive canon is The Cameraman. Other quibbles? The picture-restorations vary from clean to flickery. Cops, for example, is a hugely inferior transfer to the version included as an extra on the previous DVD release of The General. And we get just one extra in the shape of 100-min documentary The Great Stoneface, beginning with an incredibly funny, poignant image of an wrinkled Keaton trudging out of the sea before taking off down the road. Sadly, an apt metaphor for what emerges as a similarly aimless ramble, trading insight and exploration for lengthy clips of films already featured in the boxset. Happily, also on release this month is A Hard Act To Follow, a terrific 150-minute doc narrated by critic/filmmaker Lindsay Anderson. Carved into three wedges, it tracks the comedian’s entire life via wonderful personal recollections from old man Keaton and his aged ex-collaborators. There are numerous precious stills, footage from early films with Fatty Arbuckle and an affectionate-yet-incisive approach, all of which make for compelling viewing. Best news of all? With Chronicles retailing at less than 30 quid, you can afford to buy A Hard Act, too. Actually, you can’t afford not to. Ten great movies by Keaton’s silent-clown contemporary – including their one buddy-up Limelight and a fab doc. Bit of a sting at 140 quid, mind. 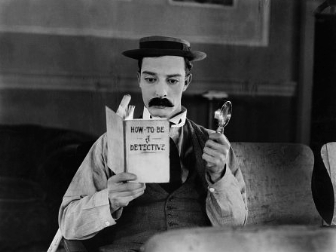 Available for the first time on two-disc DVD, nine films by “the third genius of silent comedy”. Iconic and essential. Four great pratfall kickabouts from the comedy quad, including their apple-chucking anti-war masterpiece Duck Soup. 1. Documentary The Great Stone Face includes the only record of Keaton smiling on film – an early movie he made with Fatty Arbuckle. 2. The name ‘Buster’ came from Harry Houdini, impressed by seeing baby Keaton tumble down a flight of stairs unhurt. 3. Keaton proudly believed The General was more historically accurate than Gone With The Wind.